Derrick Kosinski & Scott Yager are joined by CT Tamburello. For our 100th episode, there is really only one guest that could live up to the hype and was deserving of this momentous occasion. 2 Time Champion (plus 2 time Champs Vs Stars Winner) Chris Tamburello aka CT (@TheOfficial_CT) is on most people's Challenge Mount Rushmore. His name is synonymous with the franchise. Simply put, if you are not excited for this episode...you are not Challenge Maniac. CT joins Derrick (@DerrickMTV) ... See More and Scott (@SHOTOFYAGER) to share his casting story, talk about fatherhood, what his favorite era of The Challenge has been, how he became one of the faces of the show, how he feels about Paulie, Bananas, Veronica, Ashley and The Young Bucks, who he'd like to see back on the show AND MORE! Play in our FREE Draft Kings Contest THIS SUNDAY at dkng.co/challengemania and win a FREE TRIP to the Challenge Mania Live of your choosing! Terms and Conditions apply. See site for details. Check out CT's new movie THE HABIT, in theaters soon! For now, check out the trailer for the film on YouTube, brought to you by the filmmaker behind the cult classic Oxymorons, Johnny Hickey! ALL WEEK you can get all heavyweight T's at www.ChallengeMania.Shop for $24.95. That's $10 off the regular price of $34.95. Buy two and you qualify for FREE SHIPPING until 1/22! The FREE SHIPPING CODE appears at the top of the shop page. Head to www.TakeCareOf.com and take their personal survey. Find out what vitamins you need and get them mailed to you in convenient daily servings. Get 50% of your first order with the code CHALLENGE50. With the new cast for The Challenge: WAR OF THE WORLDS out and the new season almost upon us, there is no better time to become a Challenge Mania Patron! 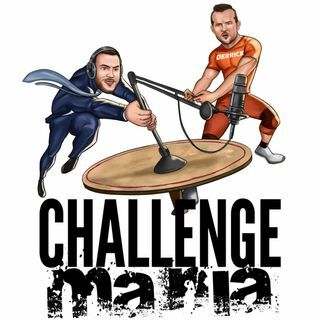 Head to www.Patreon.com/ChallengeMania to find out what sort of BONUS PODCASTS and other fun stuff we have going on over there!